Posted on January 16, 2012 by tessa.morrison. 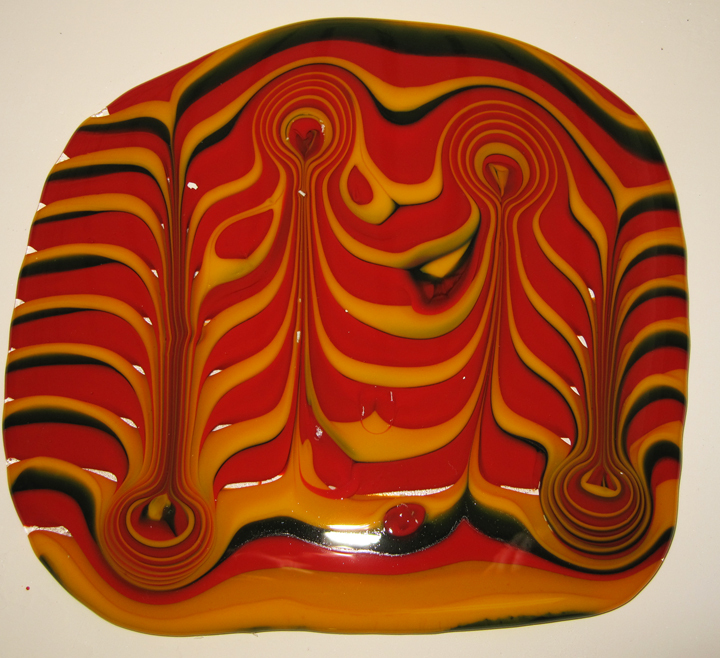 When you create fused glass you never work with an open flame. 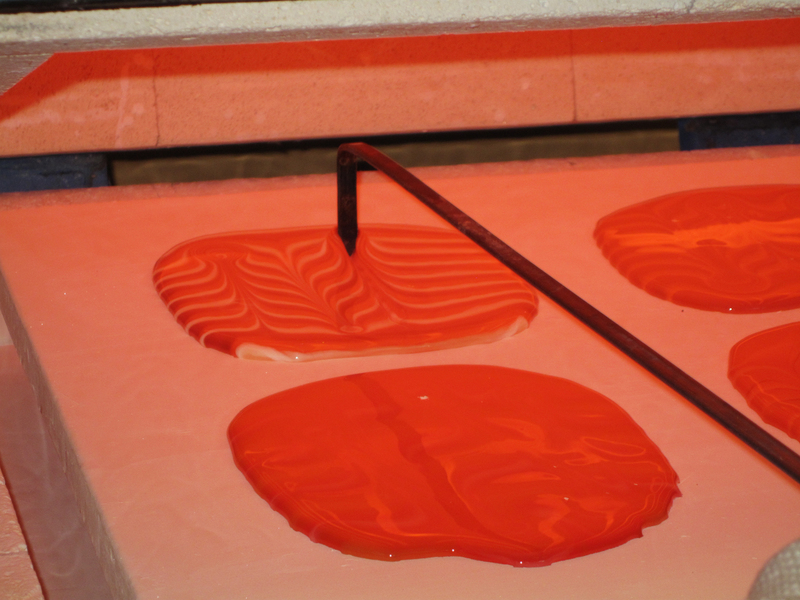 Its all done in the kiln, but there is glass combing, which is where you open the kiln while it is still at glass melting temperatures and run a metal rake or hook through the glass to get cool effects. Even then, there is not an open flame, there are metal elements in the sides and top (depending on your kiln)producing the heat. This technique is not unlike dragging a knife through the icing on your brownies to create fancy patterns. This was my first glass combing piece. It consists of pimento red, forest green, marigold, and clear Bullseye glass. Picture courtesy of Helios Kiln Glass Studio. The glass in its glowing, molten and pliable state. Photo courtesy of Karen Tarlow. 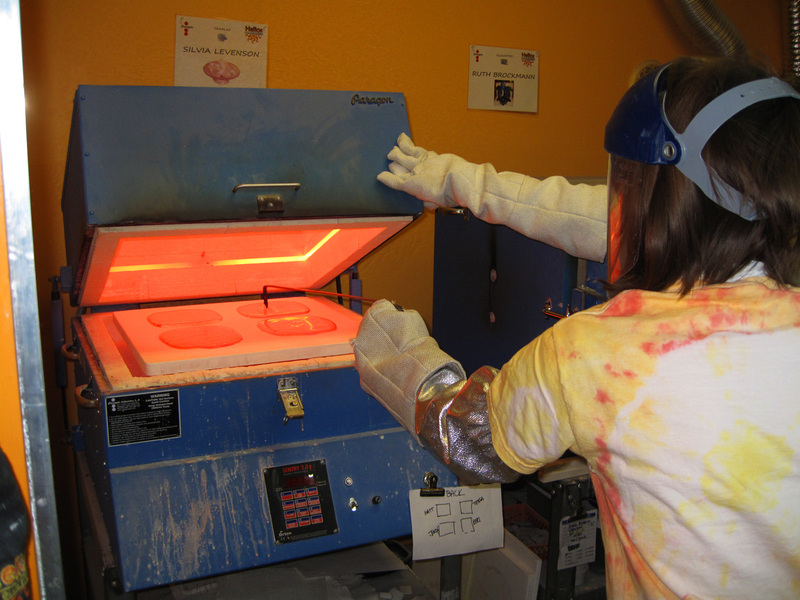 Me combing glass at 1700 degrees. Photo courtesy of Karen Tarlow. This entry was posted in Fused Glass Art and tagged Austin artist, fused glass, glass art, glass combing, Helios, kiln glass, Tessa Morrison, warm glass by tessa.morrison.. Bookmark the permalink.